Once you start fish oils in rare situations you may note a “fishy” smell around your toddler. The following will cover why this happens and how in all but rare cases this can be corrected. 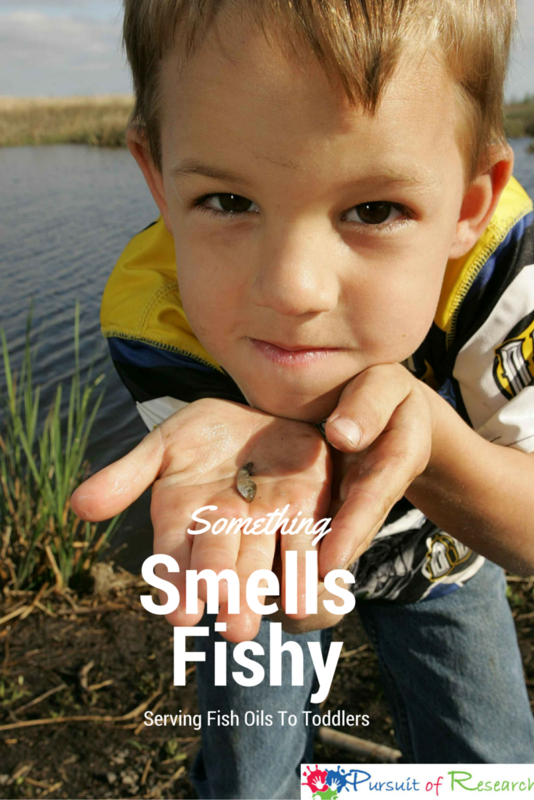 Even a little fish can stink! Clearly the preferable way to give a child fish oils is to have them swallow the capsules. This is not possible for toddlers. In addition if you have a child with special needs it may take even longer to teach them to swallow the capsules. I’ll cover how to teach a child to swallow capsules in another blog. Don’t use reusable plastic as oil binds to the plastic. Think spaghetti sauce and orange rubbermaid containers. When you wash the sippy cups and other reusable plastic you are not going to remove all the oil, so the cup will smell like fish, and you’ll possibly even have fish oil steam when you open your dishwasher. If your resusable plastics already smell like fish, you may want to start fresh. A rare reason for a fish smell would be Fish Odor Syndrome or Trimethylaminuria. Trimethylaminuria is a genetic disease; symptoms are often present from birth. Fish odor syndrome is characterized by an offensive body odor and the smell of rotting fish due to the excessive excretion of trimethylaminuria (TMA) in the urine, sweat, and breath of affected individuals. Having this problem does not make people sick in any way, but it certainly is embarrassing. In the past 16 years our of all the families I’ve outreached to through the Cherab Foundation there is only one child and his mom who possible have a rare metabolic reason for Trimethylaminuria. In fact Trimethylaminuria is so rare that even though the mom is an MD she didn’t even suspect this as the possible cause of the fishy smell her and her son had. However this mother and son were never confirmed as they are using nutritional methods to support the metabolic systems and continue to consume fish. Dietary methods are currently the only way to treat this condition. The worst foods to consume if you have trimethylaminuria would be fish, eggs, liver, and kidney. If that’s not enough, also soybeans, peas, and mayonnaise have to be avoided too. Eggs, soybeans, and mayonnaise can be hard to avoid, because they are part of many packaged foods. This diet clearly would be difficult to follow, but it’s better than smelling like rotten fish. If this condition is suspected the doctor can order a urine test which will help determine if the diagnosis is Trimethylaminuria. 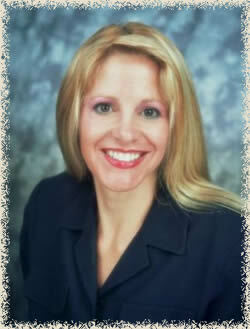 Diagnosis is also possible through gene sequencing (done via a blood test). Again though Trimethylaminuria is rare. Dealing with children and fish oil you have to be prepared. 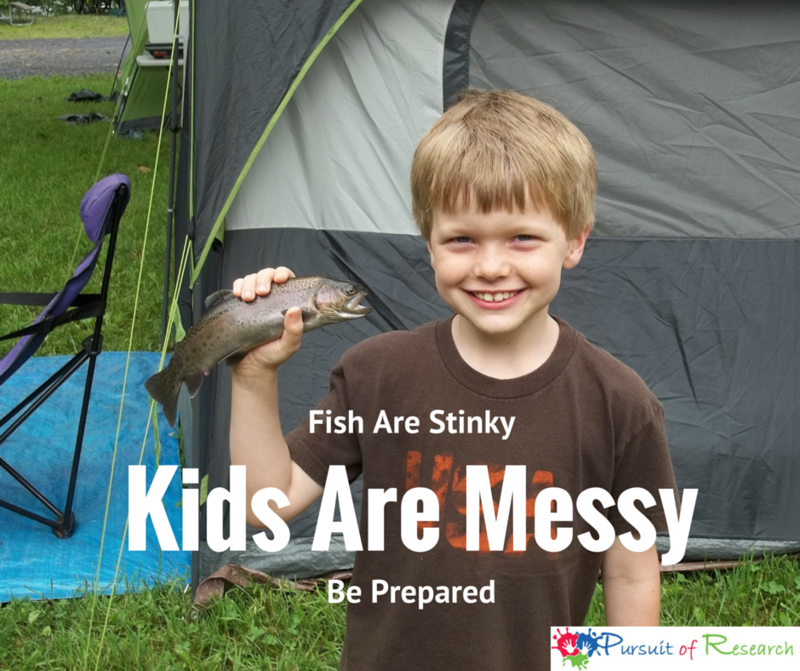 Kids can be messy. If you don’t blot their mouth after serving them fish oils, they will probably wipe their mouth on the back of their hand, and then wipe the back of their hand on their clothing, or your couch. Even if it’s on their clothing the smell of fish is difficult to remove sometimes taking 3 washes to come out. My brother is a captain and a maritime attorney, and on the ships they use lemon to clean away any fish smells off the ships, so you can try that too. If it’s their breath, most kids don’t brush for the full 2 minutes they should. If you are noticing fish breath make sure they brush their teeth, and tongue too if he can stand it. If you don’t have a sonic type toothbrush that may help. Good oral motor stimulation if your child has a communication impairment either way. How Do You Serve Fish Oils? 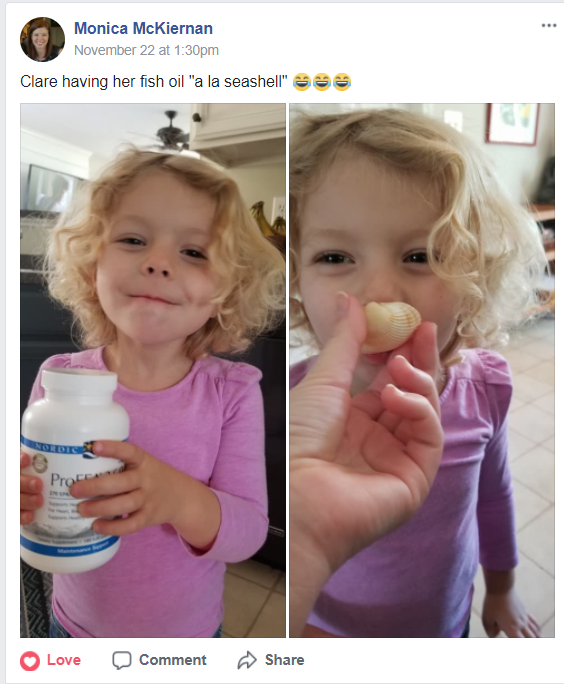 But for many of us the child will either hate or not like the taste of fish oil -even with a seashell. So for the rest of us, here are tips for serving fish oils to children. Right after the fish oils go into their mouth, blot their lips right away with the paper towel to make sure you remove the chance of any fish oil going anywhere but in their body. After you blot their mouth give them something to drink and blot their lips again to make sure you have every bit of fish oil cleaned off. If you don’t blot their mouth, many will wipe their mouth with the back of their hand, and then onto their clothes, hair, or God forbid furniture! Below are helpful tips on how to get yucky magic fish oil into kids that worked for me when my son was younger. Trust me totally worth the drama! My 5 year old apraxic son Tanner is a trooper and takes the NNProEFA 3.6.9. from a spoon every day. I hold his nose for him, but he doesn’t mind the taste. We started the holding the nose thing when Tanner used to take the efalex, which is very fishy smelling and tasting, and it’s kind of our ritual now. I rip only half of the protective waxy seal off the top of the NNProEFA 3.6.9. bottle, and put a pin in the part that is left. When it’s time to give Tanner his NNProEFA 3.6.9., I open the top of the bottle, pull out the pin, put a hole in the capsule, put back the pin, and squeeze the oil onto a spoon. 1. We would put just put a drop of fish oil in the middle of the bread for a sandwich and cover with peanut butter, a drop in the middle of a pancake, a drop in the middle of a bowl of spaghetti, etc. if we put too much fish oil, Tanner would not eat the food. 3. I used to bribe Tanner with gummy bears that he could have after. Didn’t work as good as the first two. But for a long time we did a combination of number one and number three. 4. Tanner’s older brother started taking the fish oil, and Tanner wants to do what Dakota does. 5. As Tanner got older, at about four, we started calling the fish oil “yucky magic fish oil which helps you talk” and we really made a big deal about how yucky it was, and would “show off” to people how Tanner could take this yucky stuff and eat it right off the spoon. It worked for Tanner! It was lots of work, but well worth the results. If your child will not take NNProEFA 3.6.9., maybe buy some efalex and try that. Compared to efalex, a sock would probably be a treat! Again, some EFAs are liked by some children-hated by others. With NNProEFA 3.6.9. – many kids from the Cherab group will just eat it from a spoon, or chew the capsule since borage oil is naturally sweet. I can say that NNProEFA 3.6.9. does not smell like some of the other EFAs we’ve used. After a year and a half of Tanner hiding behind the couch when it was time to take other fish oils, this was amazing even without all the great breakthroughs he’s had! Some and found serving protein shakes or fish oils in a syringe or shovel to be easiest. “Use the proper implement for liquid medicines. Don’t use a spoon–too much chance for spillage (and, unless you use a measuring spoon, too much chance of giving the wrong amount). My personal preference is a medication syringe (most pharmacies carry them). 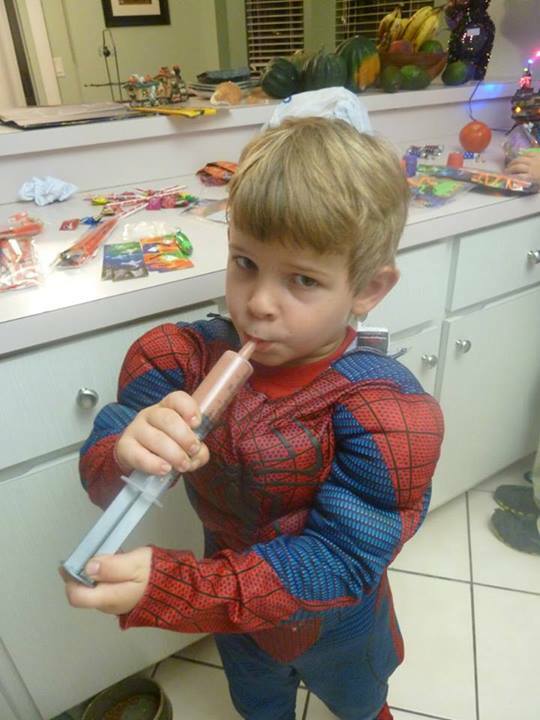 If you have a preschooler or older who freaks a bit at getting stuff squirted in his mouth and will cooperate, use the medication spoons that have a cylinder for measuring as a handle (also available in pharmacies)–it allows you to pour out a little at a time. Aim back (but not too far back) and to the side. If you go too close to the front it’s easier to spit out, but if you go straight back the child may gag. Don’t squirt all at once. As tempting as it is to get it over with, if you don’t want to be wearing it, wait until they swallow each bit before giving more. If you’ve got a squirmer: hold your child so that they are leaning back. Put the arm closest to you behind your back, and hold the other one down with the hand of the arm that’s cradling them. If you’ve got a kicker, you can put their legs between yours. Should I put fish oil in my child’s reusable plastic cup? You don’t want to put fish oil into any type of reusable plastic no matter what type of liquid or food it’s mixed with because the oil will bind to the plastic and you will find it difficult if not impossible to get the smell of fish out of the cup no matter how much you wash it. Think of when you put spaghetti sauce into a plastic Tupperware like container and the container turns orange from the plastic absorbing the pigments from the spaghetti sauce during the wash. While one can deal with an orange container, try to deal with fish oil steam when you open your dishwasher! Most likely you’ll throw any plastic cups away that you put fish oil in. You preferably want to serve fish oil in glass, ceramic, metal (such as on a spoon) and if you use plastic -disposable plastic. Here is another way to serve fish oils that is super neat demonstrated by Colton! Thank you, Star Johnson, for this creative method that worked for your daughter! Could I mix it with an ounce of lemonade? Would the acidity change the effectiveness? I was thinking to use a stainless steel cup with a disposable straw. If I do use the medicine syringe (disposable type from the pharmacy) is it safe to use more than once? Would I need a new syringe every day? The acidity doesn’t appear to affect it as others have mixed the fish oils with lemonade, and in addition, natural lemon is added as flavoring to NN ProEFA 369. I never used the syringe for serving fish oils, but if you do, I would recommend keeping it in a Ziploc in the refrigerator after rinsing it out as best you can, and changing it at least every month. No matter how well you try will never get all that fish oil smell out of it because the oil again will bind to the plastic. But since the oil in the bottle stays fresh for 4 months, perhaps the syringe can be OK in the fridge too for at least a few weeks. I’d believe so anyway. Try some of the other serving suggestions, though, you may not need to use the syringe. It’s odd but many of the kids don’t appear to mind fish oils as much as we’d think, in fact, some even appear to love them. Thank you so much for a very informative post. 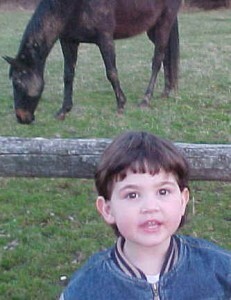 I am going to start my 4.5 year old son recently diagnosed with autism on NN Pro EFA369 and Pro EPA today. My understanding is 2 capsules of the former and 1 of the latter every day. Please correct me if im wrong. 1. Can i mix it with his porridge? Yes you are correct 2 NN proEFA 369 and 1 NN ProEPA as I have here https://pursuitofresearch.org/2016/09/13/dosage-of-fish-oil-for-children/ You can start the first few days with one capsule of the NN proEFA 369 and you’ll know pretty quick if your child is a responder. Typically a day to three weeks.